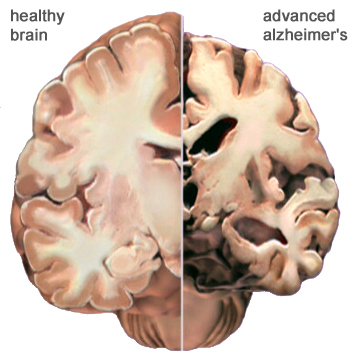 Science Tuesday: A cure for Alzheimer’s? Today, more than 5.4 million Americans live with Alzheimer’s disease, according to a 2012 Alzheimer’s Disease Research. And, unless some method of controlling or curing Alzheimer’s is discovered soon, a predicted 15 million Americans could live with the debilitating disease by 2050. However, a recent MSN article suggests a new method of preventing the growing Alzheimer’s epidemic might lie in the near future. Scientists are experimenting with a new Alzheimer’s treatment called deep brain stimulation, or DBS. Researchers hope the new approach—also known as a “brain pacemaker”—will slow the damaging effects of Alzheimer’s and replace current drugs and implants, according to the MSN article. The 5-hour operational process, however, is anything but simple, as described in the article; small electrical wires are implanted in areas of the brain after several holes are drilled in the patient’s skull. While this new experimental method will not target the onset of Alzheimer’s, scientists hope it will slow the progression of memory loss and damage in patients. Researchers do not know how long the new treatment’s effects will last. In fact, they are not sure the treatment will be successful at all. One patient of the treatment, a Canadian man who has had the implants for four years, shows promising results—his condition since the implants has not deteriorated. However, scientists cannot certainly attribute his success to DBS without further study. In the meantime, several dozen people with early-staged Alzheimer’s will be implanted with the pacemakers in the upcoming months. These patients will be closely monitored and studied for the next several years. In the MSN article, researchers at Ohio State University explained how constant electrical stimulation of memory-linked brain circuits might keep neural networks active for longer. This, they hope, will hinder the damaging effects of dementia and Alzheimer’s. DBS has been used previously and in a variety of patients, including those suffering from Parkinson’s disease and other movement disorders. However, this is the first time it is being used with Alzheimer’s patients. Scientists are not only testing DBS in major diseases and illnesses such as these, but are also exploring its effects in parts of the brain that are linked with depression and appetite. Although it’s still too soon to say, DBS may be the answer not only to treating Alzheimer’s, but also to curing and preventing it. Who knows? It might be a cure-it-all in regards to other mental illnesses, imbalances and functions. Only time will tell. Superb new, very promising! Hopefully… yes it will be a cure- it-all. We can hope and pray!